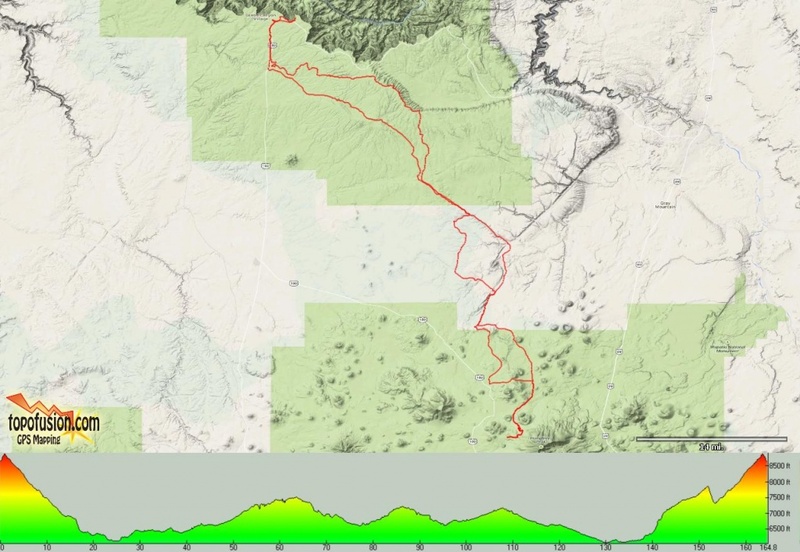 What: 2-day bikepacking route from Bismarck Lake TH to Grand Canyon South Rim. When: Sat. June 4th - Sun. June 5th, probably start riding shortly after daybreak - 6a or so. Where: Ride the AZT northbound & forest roads southbound. Loop-ish/OnB-ish type of route. Who: Anyone who can handle 85 miles per day and be self-sufficient in the backcountry. Water: It is scarce on this stretch. However, the AZT has added a cache box at the south end of Babbitt Ranch. This is about 20 miles into the ride and mostly downhill to get there. We probably wouldn't need water by then. There was water in the metal trough at the spray painted 'Russell' tank closer to the halfway point. Bring a filter. Both of these water sources are unreliable, so plan accordingly. It's about 78 miles from the start to Tusayan, where resupply is available. This is a great route, all dirt. Roughly 65% on forest roads & 35% on singletrack. Only one short, 5-min HAB, that I can think of. Climb the Grandview Lookout tower for a unique view into the Canyon. I need to do some minor tweaking of the route as the AZT has been re-routed at the South Rim and the final miles of forest road on the return need to be moved off a fiber optic cable corridor. I'll post up a track & map as soon as I get it ready. Meet at the Bismarck Lake trailhead on Friday (I plan on being there in the late afternoon). From Flagstaff, take US180 towards the Grand Canyon, turn right on FR151 (second entrance as you wrap around Humphrey's Peak), stay right on FR151 at the split for FR418. Turn left onto FR627. This is the trailhead turnoff, there is a sign, but it may be hard to see. Here's a Google map of the FR151 portion, it wouldn't let me add FR627, so where this map ends is the turnoff for FR627. We'll try and camp at Mather Campground in the hiker/biker sites, if they aren't available we'll find a spot nearby. Post up with any questions. So far there are 4 of us going: myself, Jeff, Nancy & JoeP. Wish I could join you on this one but I would not survive day one, would probably take me four days to complete this route in my current condition. Really looking forward to getting back into bike packing shape. Thank you for the inspiration John. Was good seeing you at OHSO last week. 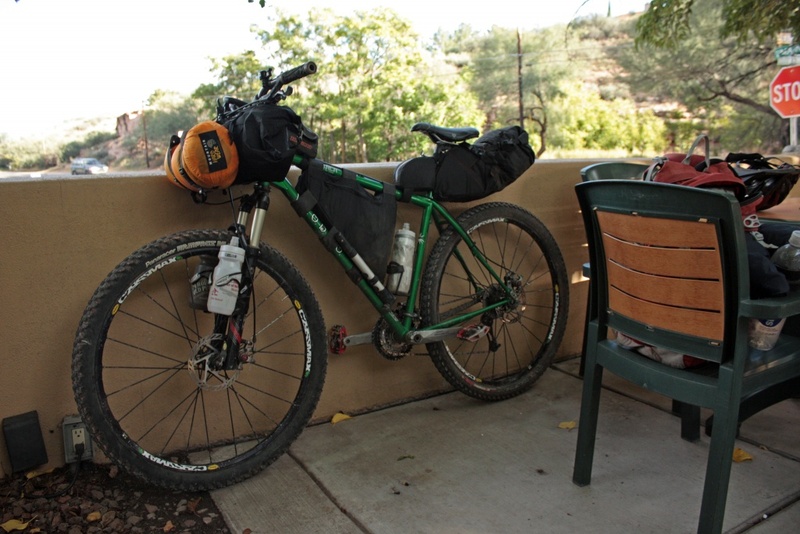 This will be my first bikepacking trip so I am looking forward to it. I am happy to have 3 seasoned bikepacking veterans to guide me. I would love to join, but the 'rents are in town. Wish I could join but family duties call. Plus, at my current "mileage," I'd probably get to the south rim in three days. Damn...on my birthday to boot. Unfortunately my weekends don't fall on normal weekends...this ride is certainly on the to do list though. Damn. Wish I could get out on this one. Enjoy yourselves! tentatively IN...pulled some favors at work now I just gotta tell the lady. John, Not sure if you know this. There is a huge metal tank behind the earthen dam at upper Lockwood tank. Like thousands of gallons when I went through there. You have to go right at the T intersection heading towards the singletrack leaving Babbitt Ranch. Worth checking out. I'm guessing they truck it in and hopefully it is o.k. to use for AZT folks. I did not know that, thanks Sean!! I'll check it out. Sounds interesting. I doubt I could keep up but I might try this on my own as a two day ride each way? Can you give me some idea about how long and steep the worst climbs on this are and if there are any places that might require 'portaging'? I have pulled a heavily loaded bob trailer for 1000's of miles on highways. There's not much steep climbing at all, probably just the few miles heading south as you regain the pines from Babbitt Ranch. This is a new portion of my route, so I can't fully give you a review on it. There's one short HAB section heading north, just as you reach the Coconino Rim, it's signed with a 'bike bypass' route, but that really isn't much better. It's about a 5-10 minute HAB. That's really about it. Looks like it's going to get pretty warm (for a Flagstaffian)...how much water is everybody planning on carrying? I will be tagging along. I live in Tempe. Let me know if anyone would like to carpool Friday afternoon. I am bringing 100 oz camelback, 25oz bottle, 21 oz bottle. I also may bring a small 2L collapsible bladder, but I am not sure yet. Yep, it's going to be a warm one. I'm planning on my usual 100oz bladder, I'll probably bring an extra bottle (2 total), 32oz Gatorade, can of Mtn Dew or the like and perhaps an extra 16oz bottle or two of H2O. Plus a filter. If you typically drink a lot, bring a lot + extra. I have downloaded the general contours (only 40 ft so they can miss a lot) but your information has enabled me to identify the areas where the steepest climbs are. I will be pulling a bob and just have to see if it is worth trying to portage the bike and trailer separately up the HAB's. I intend to identify alternative routes (even the highway) if I decide against trying the HABs. This will be my first bikepack. Tired of touring highways. Eventually I think I will add an electric mid-drive and and solar charging system to a trailer so I can carry enough food for 'weeks?'. Best of luck on your ridesss! Its a really bad feeling to run out of water on a hot day. Dehydration is no joke. I'd recommend bringing more than you think you'll need. Worst case you carry some extra weight. yeah... So you think a 3rd bottle (25oz) on electrial tape mount under the downtube will work better than more water on my back? I do plan to bring my water filter. Worried about space with the extra bladder. Need to test fit all my gear to camelback to make sure it all fits. It is tough to securely attach a bottle cage to a carbon frame. You could try attaching to a fork leg with hose clamps - I've seen a few people do that. But then you'll want to test that before heading out on a big ride. Id recommend shoving a 32oz bottle of something in your pack, like John does. You won't need cooking gear, so that saves space. Bottle cage on the forks works well. Here's what I did the few times I've done it, worked perfectly BTW. Cut a small piece of inner tube to put between the cage & fork. Run two zipties around the cage to secure it, then some electrical tape or the like over the cage & ties. Those suckers aren't moving. It's not the greatest shot, but you get the idea. This was during the Coco250 back in 2012. I test fitted my camelback last night and I got in normal 3L badder and a second one at 1.5L as well. Not idea to carry that much water, but better safe than sorry. holy hell that was hot...thanks a lot for getting this together and putting up with my heat grumblings all of day one John. Day two went much better. That gravel stretch out of Tusayan was perfect at 6AM, rolling through Babbit ranch into a headwind during the heat of the day was made tolerable by taking turns pulling and drafting with Ben (he probably blocked twice as much wind for me as I did for him...) That "new" section at Cedar tank almost broke me but once we got up on top it was great riding. Yeah, definitely a warm one out there!! Glad you fared better on the return. I really hit the wall over the final 20 miles, took forever to finish. We ended up having 17 riders for this one, great turnout in spite of the conditions. Thanks to everyone for coming out and making it a fantastic weekend. Yes great ride John. Those last 27 miles were pretty tough. For a minute I though I might get shot going behind that guy's house on that "road". That climb was nasty, but I actually had a burst of energy there so I rode up about 3/4 of that. I really enjoyed the final climbs up AZT to Bismark lake. Hard, but worth the effort as that is a really nice section. What time did you finish at the car? Finished up at 5:30 with Holly & Josh. We took tons of shade breaks after Cedar Tank, then I kinda hit the wall for a few miles once back on the AZT singletrack. It was good trail, I just didn't have much left in the tank until I reached FR418. Got a second wind there and really enjoyed that final descent on Bismarck Trail. I knocked out the first 60 miles in 6 hours or so including my tourist stop at the S. Kaibab TH & a sit down breakfast in Tusayan....then it took 6 hours to go those final 27 miles!! I'll blame the warm temps!! Even with the HAB after Cedar Tank, I thought this was the best return option of the 3 I've done so far. The HAB wasn't really too long and the footing was fine. It felt good to walk for a bit anyway after all that spinning. The riding up top after the HAB over to the AZT was pretty good. FYI: for anyone riding the AZT between Bismarck Lake & FR418 there's only one downed tree. A bit awkward to get over, but not terrible. Nancy and I "opened" McDonalds in Tusayan. I think that was a great choice as it got us to Cedar Tank (with Joe) at around 10. Even so, it was plenty warm - you guys must have really baked. The new route is WAYYYYY better than last year's version. But I'm not sure it is an improvement over AZT. That's an area we can agree to disagree on. The thing about this ride is that the first half is considerably easier than the second half due to the U shape. You can't just take your halfway point and double the time. It was pretty cool to see such a big group come out for this. Ben (not sure if he's on here or not) had a great idea to cheat the terrain a bit and stretch out the ride while we were taking a break half way up the Cedar Tank ridge. Drive out to Cedar tank TH the afternoon before, park and ride up to Bismarck lake in the cool late afternoon/evening, ride out to the GC next day, camp, cruise back to the car at Cedar Tank on day three and be done. I'm Ben AKA Bug Shield. It was good riding with you, John. Yep, I really considered doing that especially because I wanted to run a tall gear for the roads and thought I might really suffer that climb but in the end I decided not to be anti-social and just do the same ride as everyone else. As it turns out, that 30/18/29+ didn't treat me too badly on the final climb. If anything it hurt more while trying to gain Grand View but that's likely more because of me than the gear. Nice. Can't believe that ******* riding around without a pack. I was at the back of the pack after going to the S. Kaibab TH for sunrise. Arrived at Cedar Tank at 11:15a, wasn't too bad through the ranch, but I was ready to be up in the pines. Probably took a bit too long at the tank as things continued to warm up, at least there were plenty of shade breaks available....and my thermos of margaritas was still cold!! As for routing, the one section I'll change up is what you & Nancy did after Cedar Tank. I think I rode that variation last year, but it was nice to check out a different option this go-round. Next year we'll veer right on FR550 off of FR523, make the left onto FR514 & rejoin the AZT at Kelly Tank. Saves a bit of mileage and about 400' of climbing. 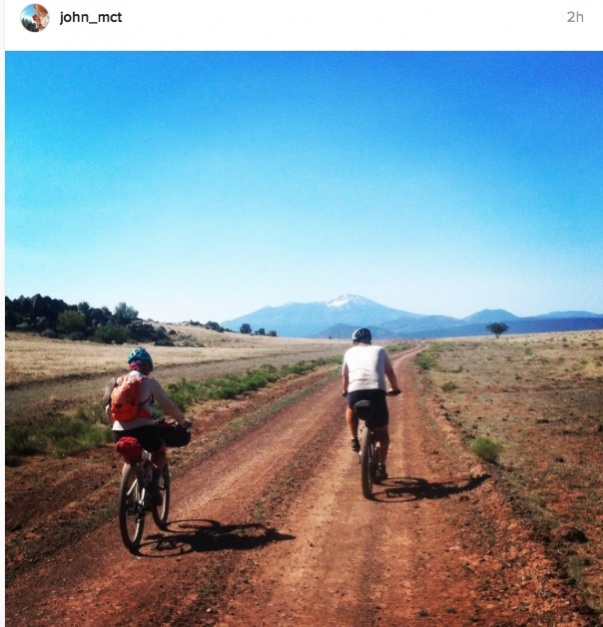 Riders are always welcome to simply stay on the AZT after Cedar Tank or anywhere else for that matter. I'd be interested in riding southbound on the Coconino Rim passage from Grandview, maybe dumping out via the bike bypass section (hopefully the ATA can get that cleaned up) & ride south along the Russell Tank section too as all of that trends downhill. Pickup the current route just after the Moqui Stage Station at FR301. We could skip Tusayan completely on the return, stay on the park road out to Grandview & cut in there. Doesn't seem to be a bunch of elevation change since you're near the rim's edge the entire way. Truth. For me it's more like: Time to Lockwood Tank x 2 = ride time remaining. I don't know if anyone really "lives" in that house. I've ridden that jeep track several times and have seen several people working on equipment around the property. They always wave and seem pretty disinterested in me traveling right through their "backyard" to access the jeep track. John- that cliff face/scree slope story I told you about...is at the right fork on top of that hill above the water tank where we continued straight/left. I loved that jeep track, I was spun out on all range land.